The letter is addressed jointly to the Secretary of State for Transport because CCAL understands that the Department for Transport (DfT) has joint responsibility for the UK meeting its legal obligations in respect of air quality. The Prime Minister has been copied, given the cross-departmental issues raised and all London’s MEPs and others have been copied given the imminence of the related deadline of 31 October 2008 for notifying requests to the European Commission (the Commission) for time extensions to meet the corresponding limit values for PM10. The Campaign for Clean Air in London notes the obligation under EU legislation referred to in the consultation document for the government to produce plans and programmes to ensure compliance with the limit values “within the required timescale”. CCAL considers the last few words unnecessarily vague since the obligations must be met by January 2010 (under 1999 legislation) or January 2015 (if the UK is granted a conditional time extension under the new EU Directive on ambient air quality and cleaner air for Europe (the new AQ Directive) that entered into force on 11 June 2008). CCAL has three main concerns with the draft report which is the subject of this consultation. First, it does not show or refer to any expected date by which the UK will ensure compliance with either of the limit values for NO2. Second, the plans and programmes currently proposed together are clearly insufficient to achieve the limit values for NO2 or indeed to make any reasonable effort to do so by the required date of January 2010 (or January 2015). Third, the report includes no contingency plans to comply with the time extension obligations for NO2 under the new legal regime if the UK fails to meet the limit values for NO2 by January 2010 (as currently seems likely) e.g. Article 22 paragraph 3 and/or the January 2015 deadline. CCAL is disappointed that the first two points have not been addressed in the current report when it raised them in the identical consultation some 12 months ago. In CCAL’s view, the report does not meet the requirements of Annex IV of the relevant EU Directive. CCAL is therefore copying this letter to Commissioner Dimas and urging him please to reject the UK’s report and to commence necessary enforcement action against the UK for failing to meet its reporting requirements – unless these points are addressed fully in the submission as required by 31 December 2008. In CCAL’s view, the Commission could commence legal action against the UK for breaching limit values for NO2 as soon as there is sufficient evidence that breaches of the hourly limit value have occurred. Results from 2008 indicate that this could happen as early as 31 January 2010. The Campaign for Clean Air in London has only one aim which is to achieve urgently and sustainably at least World Health Organisation (WHO) recommended standards of air quality throughout London. Given that most of these have been required to be met since 1999 legislation by January 2005 (in respect of coarse particulate matter i.e. PM10) and January 2010 (for nitrogen dioxide i.e. 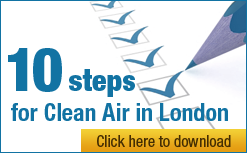 NO2), CCAL’s immediate priority is to press for air quality laws to be complied with fully in each year leading up to the London 2012 Summer Olympics. CCAL has received support from Mayor Johnson (and previously Mayor Livingstone), leading politicians from the four main political parties in London as well as leading business and community groups including the Central London Partnership, London First and The Knightsbridge Business Group. We have also received a Pledge of support from Environmental Protection UK (formerly the National Society for Clean Air and Environmental Protection). Our campaign website address is shown in the letterhead above. CCAL notes that, in 2007, Defra was required by EU legislation to report on plans and programmes to meet EU Limit Values for particulate matter (PM10) and NO2 by 31 December 2007. CCAL understands, following the entry into force of the new AQ Directive, that the Commission has allowed the UK to make a submission in 2008 only for NO2 in order not to duplicate the work to be undertaken as part of the separate time extension (or enforcement) process for PM10. In CCAL’s view, the UK government has exploited cynically the Commission’s practical approach by: submitting its NO2 reply under the old legal regime (ignoring the obligations that will need to be met under the new AQ Directive); and planning to submit its PM10 reply under the new legal regime (ignoring the deadline of 31 December 2008 that would have been required under the old legal regime). Worse still, when the Commission allowed the UK to submit only plans and programmes for NO2 as part of the current annual process, it announced that the UK (and other Member States in breach of Limit Values for PM10) should “provide information by 30 September 2008 on the steps they are taking to achieve compliance [with limit values for PM10]”. Further, the Commission made “clear that Member States are expected to notify requests for time extensions by 31 October 2008. Failure to achieve either compliance with the standard or to submit notifications by that date will lead to legal action against the Member State concerned”. CCAL understands that the government plans to miss, by many months, the 30 September and 31 October deadlines for PM10. How can the government justify needing to undertake a public consultation on PM10 plans and programmes in the first half of 2009 when it would have had to have conducted just such a consultation – to the same time as this current NO2 consultation (which closes on 28 October 2008) – if the Commission had not given the UK dispensation? Worse still, while ignoring the Commission’s directly inter-related requirements? ·NO2 Hourly mean concentration – Exceedance of the LV + MOT at Marylebone Road with 203 exceedances (compared to 18 allowed). NO2 Annual mean concentration – 41 exceedances in the UK of the LV + MOT with an estimated 765,443 people and 86 km2 exposed to a level above the Limit Value in London alone. CCAL is concerned that the above picture creates a misleading impression for the Commission since: data from many sites in the excellent LAQN is apparently excluded from the sample; not all of those even monitor all air pollutants; and not enough monitoring takes place. Please note, for example, the busy Brompton Road which the LAQN says had 112 exceedances of the hourly mean plus MOT (i.e. greater than 240ug/m3) for NO2 in 2006 (compared to 18 allowed). With a high correlation also between PM10 air pollution levels and NO2 such sites should appear in both sets of data submitted by Defra to the Commission. On time scale of reduction, Defra says: “Time scale of delivery is the same as that required by the Directive”. Question: How can the government make this statement when the UK currently has no plans to comply with limit values for NO2 by either January 2010 (as required under 1999 legislation) or January 2015 (if the UK is granted a conditional time extension under the new AQ Directive)? Question: See 1 above. Also, please note that the Mayor of London and Local Authorities are under no legal duty to achieve the limit values. Defra says nothing on the time scale of reduction. On time scale of reduction, Defra says: “Various for different measures”. Question: What is the final deadline proposed? CCAL notes this incentive and encourages Defra to extend it to other vehicle types. On time scale of reduction, Defra says: “Not determined”. Question: How can CCAL comment on the effectiveness of this measure? On time scale of reduction, Defra says: “Various”. On time scale of reduction, Defra says: “Annual”. Question: What sort of deadline is this? On timescale of reduction, Defra says: “Ongoing”. Question: What sort of deadline is this? Question: Please note that London has no Taxi Emissions Strategy to replace or overlap with that which expired on 30 June 2008. On time scale for reduction, Defra says: “Ongoing.” Question: What sort of deadline is this? On time scale of reduction, Defra says: “Ongoing”. Question: What sort of deadline is this? Please highlight the fact that the London Low Emission Zone requires only that vehicles meet the Euro emission standards of 3/III and 4/IV for particulate matter (not NOx) i.e. they will have a very small positive impact on NO2 (or NOx). For this reason, CCAL considers the current reference to be quite misleading. On time scale of reduction, Defra says: “By 2013”. CCAL notes that this date is way after the January 2010 deadline required to be met under this consultation. Furthermore, CCAL considers that this reference is misleading because it does not state that the measure is contingent on further approvals. Defra says nothing on the time scale of reduction. Question: How can we comment on this? None of the responses proposed by Defra (or DfT) for NO2 breaches of limit values plus a margin of tolerance (“Time scale of delivery is the same as that required by the Directive”; “Various”; “Annual”; or “Not determined”) meet the spirit or strict requirement of the above legal obligations. Please ensure that the report so submitted does comply in full with Annex IV and send us a final version of it. First, as highlighted earlier, Defra is undertaking and reporting upon too little monitoring. Why are so few sites included e.g. only one for the NO2 hourly mean? Furthermore, the extensive reliance on modelling has an inevitable weakness in that it will tend to smooth out the peaks that occur in real life and have a serious health impact on citizens. Second, it has been difficult to comment on parts of the draft report such as the ‘Description of the exceedances of the limit value’ since it includes gaps e.g. estimates of the total population exposed to a level above the LV in the reference year. Third, there is no indication of the budget and/or detailed implementation plans being committed to put substance behind the 16 listed plans and programmes. Are the latter therefore included simply included for ‘show’? Fourth, why is the “plans and programmes” section, in the annex of the draft report, full of circular references that mean nothing e.g. “Time scale is that required by the Directive” (when Defra knows that the deadline specified in the Directive is January 2010)? ·Fifth, what is the basis for Defra stating on page 4 that “In a small number of cases, zones and agglomerations [where] exceedances of the limit value, or limit value plus margin of tolerance do not coincide with local authority AQMAs. In these cases, it is anticipated that limit values will be met by a combination of other national and European measures”? What due diligence has Defra undertaken to substantiate this assertion? ·Last but not least, sixth, CCAL agrees with Defra (Form 5 page 30) that “more needs to be done to meet objectives for nitrogen dioxide” but is not satisfied when Defra goes on to say “we continue our efforts at both national and local levels to ensure that limit values are met in all areas as soon as possible”. CCAL urges the government to comply with legally binding deadlines to reduce air pollution, with no excuses. Otherwise, the government’s bold statements on climate change targets are no more than hollow words. For the record, CCAL has not seen any evidence yet that the Government has produced a package of plans and/or programmes which, when taken together, will meet EU legal limits for NO2 throughout London. Indeed, CCAL considers that the government has not yet made reasonable efforts to address this often repeated concern. For this reason, inter alia, CCAL continues to urge Commissioner Dimas to take tough enforcement action against the UK as a Member State in respect of all its breaches of EU air quality legal obligations. CCAL considers, in answer to Defra’s only question (so called Question 1) on page 8 of the consultation report, “Does the report on plans and programmes to the European Commission accurately reflect the position in the UK”, that the report does not accurately reflect the position in the UK e.g. Brompton Road. It reflects accurately the position in the UK only to the extent that it shows that the UK Government does not have the political will necessary to meet its obligations under the EU Air Quality Directives to protect the health of its citizens. The question Defra should have asked for example was “Does the report etc show how the UK will meet EU air quality limit values for NO2 by January 2010?” The answer to that more proper question would clearly be “No, it does not”. CCAL records formally in this letter that it would be unacceptable for the government to submit a report to the Commission that does not meet the minimum requirements of Annex IV of the Air Quality Framework Directive (1996/62/EC) (AQ FWD) which include an “estimate of the improvement of air quality planned and of the expected time required to attain these objectives”? CCAL urges the Commission to take infringement action against the UK if it fails to meet fully these clear legal requirements. With air quality recognised by the European Environment Agency as the biggest environmental health risk, with the Royal Commission on Environmental Pollution estimating in March 2007 that it caused some 24,000 people premature deaths in the UK in 1995/96 compared to some 617 nationally only for passive workplace related smoking and 3,172 deaths per annum nationally from road traffic accidents (2006 data), it is wholly unacceptable that the Government should continue to lack the political will necessary to meet legally binding commitments made nearly 10 years ago.